What types of lens materials are available? POLYCARBONATE LENSES: These lenses are impact-resistant and are a good choice for people who regularly participate in sports, or as safety lenses in a mechanical or industrial environment. They are also a good safety lens for children who may easily drop and scratch their eyeglasses. 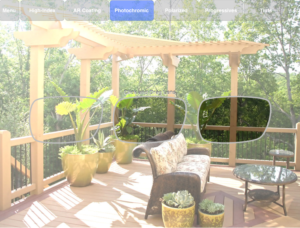 Polycarbonate lenses also provide built-in ultraviolet protection from the sun; however, they have the lowest ABBE number out of all lens types. This means the transmissibility of light through these lenses is the poorest of all the lens types. TRIVEX LENSES: These lenses are made from a newer plastic with similar characteristics of polycarbonate lenses. They are lightweight, thin, and impact-resistant and may result in better vision correction than the polycarbonate lenses for some people. 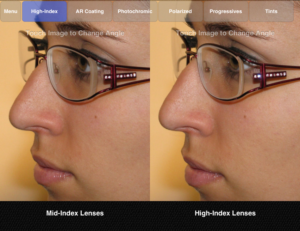 HI-INDEX PLASTIC LENSES: Designed for people who require strong prescriptions, these eyeglass lenses are lighter and thinner than the standard, thick "coke bottle" lenses that may otherwise be needed. ASPHERIC LENSES: These eyeglass lenses are unlike typical lenses, which are spherical in shape. 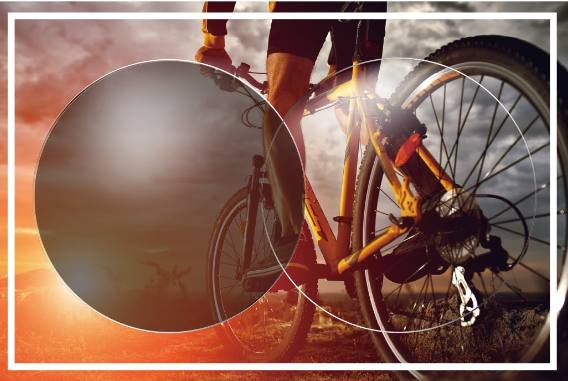 Aspheric lenses are made up of differing degrees of curvature over its surface, which allows the lens to be thinner and flatter than other lenses. This also creates an eyeglass lens with a much larger usable portion than the standard lens. PHOTOCHROMIC LENSES: These plastic lenses change from clear to tinted when exposed to sunlight (UV light). This eliminates the need for prescription sunglasses. 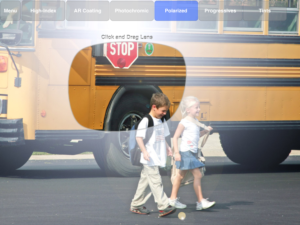 These lenses may not darken in a car because the windshield could block the ultraviolet rays from the sun, they also do not cut the glare as well as polarized lenses. POLARIZED LENSES: Light reflected from water or a flat surface can cause unwanted glare. Polarized lenses reduce reflected sun glare from many surfaces, particularly water, and are useful for sports and driving. They act like a venetian blind cutting the bouncing horizontal light off surfaces. These lenses may cause the liquid crystal displays on the dashboard of cars to appear invisible.